The Anderson large traditional 3 lamp inverted Tiffany pendant light, a classic, rich in design and washed in colour. 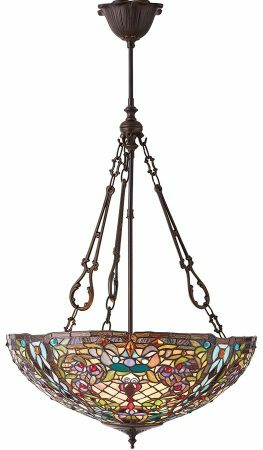 Each piece of glass in this shade has been hand crafted to create this wonderful, high quality Tiffany light. With a vast variety of coloured glass pieces set into a floral display the Anderson inverted Tiffany pendant will create a spectacular feature of coloured light fascination. Suspended from an intricate dark bronze finish ceiling mount and fixed height multi-chain suspension. This spectacular Tiffany range is a grand statement with Art Nouveau elements and enhanced with the ever popular Tiffany designs of dragonflies, butterflies and grapes. 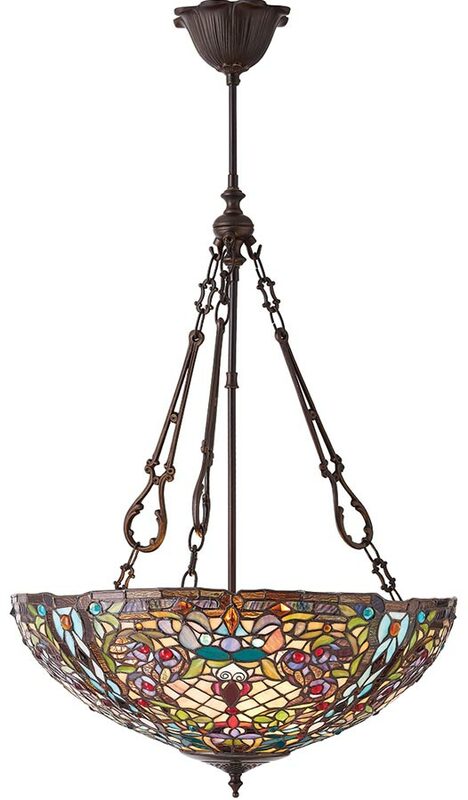 The Anderson large traditional Tiffany ceiling light, designed by Interiors 1900.